The Silicon Valley Business Journal recognized 360 Payments as the 25th fastest growing privately held company in Silicon Valley in 2018. In order to be eligible for the honor, Silicon Valley businesses submitted information regarding ownership, location, growth, and total revenue. 360 Payments is a customer service focused merchant service provider located in San Jose. The people behind 360 are passionate about improving the merchant’s experience of accepting electronic payments. 360 Payments was proud to be selected for the Inc. 5000 list of the fastest growing businesses in America in 2018 by Inc. Magazine for the fourth year in a row. The business was ranked 3020th this year, adding to previous rankings of 1771st in 2017, 1045th in 2016, and 238th in 2015. 360 Payments was named the 13th best small company to work for in the Bay Area for 2018 by the Silicon Valley Business Journal. “I truly believe that our team members are our most valuable assets. Everything we do is geared toward ensuring our employees know how much we value them and empowering them to achieve their own personal goals, while at the same time supporting their teammates and our customers” says 360 Payments co-CEO Lisa Coyle. 360 Payments provides plenty of ways for employees to grow and thrive, including regular company outings and events, resources to help with personal and professional development, and a pet-friendly office. The Silicon Valley Business Journal ranked 360 Payments as the 17th fastest growing privately held company in Silicon Valley in 2017. In order to be eligible for the award, local companies had to meet criteria concerning ownership, location, growth, and total revenue. 360 Payments was honored to be named to the Inc. 5000 list of the fastest growing businesses in America in 2017 by Inc. Magazine for the third year in a row. The company ranked 1771st this year, following rankings of 1045th in 2016 and 238th in 2015. 360 Payments partner Lisa Coyle was named a 2016 Woman of Influence by the Silicon Valley Business Journal in April 2016. Lisa’s entire professional career has been built on putting the needs of her customers, employees, and partners before her own, and that commitment shows in the way she leads 360 Payments every day. “Some of the most successful people are not successful because they know the most about their product or service or have the most money, rather they are incredible at empathizing and understanding people. Incredible results will happen when you put others before yourself and put yourself in their shoes,” she says. 360 Payments was named to the Inc. 5000 list of the fastest growing businesses in America in 2016 by Inc. Magazine for the second year in a row. Ranked at #1045, this achievement comes on the heels of a #238 ranking on the list last year. 360 Payments was named Small Business of the Year for 2016 by the San Jose Silicon Valley Chamber of Commerce. Out of a crowded field of worthy contenders, 360 earned this distinction by displaying its commitment to innovation, growth, and the Silicon Valley community. Coming off a very successful 2015, 360 Payments has continued to exhibit strong growth throughout 2016. 360 Payments was named the 3rd best small company to work for in the Bay Area for 2016 by the Silicon Valley Business Journal. “Every position at 360 has a career path, but we also bear in mind that a jungle gym structure is more important for the growth of an individual than moving up a corporate ladder,” says 360 Payments partner Lisa Coyle. 360 Payments offers plenty of perks, including 401(k) matching, company sports teams, and an office complete with flat screen TVs and a fooseball table. 360 Payments recently hosted their inaugural Client & Partner Appreciation BBQ and raised $3,400 for Big Brothers Big Sisters of the Bay Area. 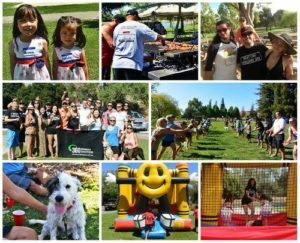 The kid-friendly fundraiser, held in Hellyer County Park in San Jose, celebrated 360 Payments’ client and partner relationships, and carried on their company tradition to give back to local charities. 360 Payments has been a supporter of BBBSBA since 2011. “It was really great to see our staff, clients, and partners with their families having a good time together. As a company in the industry that we’re in, you don’t get to see the people behind the brand. We take pride in our relationships and our community” said 360 partner Lisa Coyle. 360 Payments was honored to be named to the Inc. 5000 list of San Jose’s fastest growing companies in 2015. With a three-year growth rate of 1,865%, 360 Payments is rocketing ahead of its peers and neighbors. 360 Payments does not intend to rest on its laurels. It plans to continue pushing itself to exponential growth year after year, with new product releases and a constant, unwavering focus on customer satisfaction. 360 Payments partner Lisa Coyle was honored by Inc. 5000 as co-CEO of the 22nd fastest growing woman-led company in the United States in 2015. Boasting 2014 revenue of $2.5 million and a three-year growth rate of 1,865%, 360 Payments was named the 238th fastest growing company in the Unites States by Inc. 5000. The Silicon Valley Business Journal ranked 360 Payments as the 19th fastest growing privately held company in Silicon Valley in 2015. 360 Payments was honored for its community service and volunteer work with the Community Health Awareness Council in 2015 by the Mountain View Chamber of Commerce. The Community Health Awareness Council provides counseling services in school and clinic settings for children and families in the Mountain View community. 360 Payments was named the 238th fastest growing company in the United States in 2015 by Inc. Magazine’s Inc. 5000. Boasting 2014 revenue of $2.5 million and a three-year growth rate of 1,865%, 360 Payments has skyrocketed past all expectations.